Interests - Everything to do with Star Wars, playing football (his favourite team is Manchester United) and tennis, his favourite books are the ladybird stories, BMX bikes. It was early November 2004 when we first noticed a small bump on Daniels chest. We (Sue and I) believe it to have been caused when Daniel had fallen off his skateboard a few days earlier. We decided to keep an eye on it. Daniel had also had a cold and he started to have difficulty in breathing by the second week in November. On the first two visits to the doctor they believed him to have asthma and an inhaler was prescribed. Needless to say it didn’t work and we attended the GP for a third time. By this time his veins were very prominent and his breathing was worse each day. The doctor was obviously very concerned. Within five minutes he gave us a sealed envelope and told us to go straight to A+E. As soon as we were in the car I told sue to open it. It said “Tumour?? ?” We felt sick and my speed increased to 90mph. Whilst in A+E, a squad of doctors examined him. Blood was taken, Daniel was petrified. Following the x-ray we were told the earth shattering news that he had cancer. It was the worst day of our lives. The situation with his breathing was critical. Chemotherapy began immediately. About a week later we were told that Daniel had Non-Hodgkin Lymphoma T-cell stage 3. The chemotherapy appears to be working but every single day is a nightmare relived. Daniel is the bravest 6 year old I know. He’s spent months in hospital; endured severe pain, had 14 general anaesthetics etc. I would like to thank you for all the help and support and contacts, cards and presents received through this great site. I think that the time has come for Daniel to go onto the “Moved on” list. He has been off chemotherapy for over 6 months and is doing well. His Consultant is very pleased with his recovery and we hope this will continue. So from Daniel and all the family, “Thank you, Post Pals”. Daniel is doing very well 6 months on from the end of chemo. He is due to have his booster injections again soon as the chemo wiped them out. Daniel has now made it to the Backwell Wanderers Team (kit is black shorts and green and black vertical stripes for the top). He loves it and his favourite player is Manchester United’s Ronaldo, together with the rest of their team! Daniel has been in the wars recently. He caught Chicken Pox from his 3 sisters and ended up being unable to fight them off without being in hospital. So, in he went… for a week. He had a really bad time of it and ended up having his 17th general anaesthetic. We were assured it was for the best but the longline that was inserted only lasted 12 hours. Anyway he ended up learning how to take tablets and was eventually able to go home. 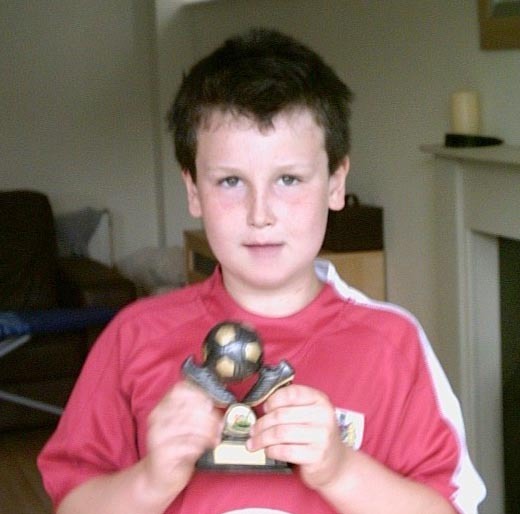 He has since started to play for Backwell Wanderers which is all he seems to live for at the moment!!! Daniel finished his chemo in November so we’re pleased but at the same time rather apprehensive as to whether it has all worked. We had a scare a few weeks ago when he ended up in hospital with concussion that he sustained at school playing football! He recovered fairly quickly but we seem to be forever paying trips to the hospital!! Daniel is on medication for another three or four months and then there will be none. Thanks to Kate, Lorna and Nicky. We love the cards and pressies. You’re all too generous. Daniel and the kids were VERY excited about the cards from the Reindeer!! Thanks to anyone I’ve missed out. The kids end up getting hold of the post before we do so we’re just left with a huge mess of ripped up envelopes! Daniel’s 2 year anniversary came on 11.11.06. He finished his chemo on this day and now has only a few months left of his other drugs. He’s full of life and he loves his football. Daniel and the girls love opening their letters and pressies! Thanks again for all the mail received. Daniel has just two more months of chemo and then it’s wait and see time. The doctors are very pleased with his progress and he’ll be pleased to stop the medication. Unfortunately Daniel seems to have picked up the “slap cheek” virus which has caused his bloods to crash. He’s well in himself but has to stay off school as a result. Thanks go to Julie for the lovely cards to Daniel and likewise to Nicky for the ones to Francesca. Daniel’s had a bit of a rough time with a nasty virus which wiped him out for a week at Easter. He had to come off of the chemo. To make things worse Gabriella ended up with Pneumonia and the entire family went down with a sick bug!! We’re all better now, thankfully. Daniel’s blood levels have been a little up and down recently. He’s also had a very bad cough and had to go to the hospital yesterday and was put on antibiotics. He already seems better. He was out pretending to run a marathon yesterday evening!! Natasha, Gabriella and poor old Dad now seem to have caught it!! Always the way! The kids love all the home made cards. They’re superb. Thanks to Nicky W. Francesca loved the jokes!! Thanks to Lorna, the girls loved the growing kit. Thanks to everybody else that have sent gifts to Daniel and the girls. Post Pals has brought smiles to us yet again this month, so thanks to you all. Daniel has had a few colds recently and Gabriella had to go to the local hospital to get checked out. She had the virus that’s been doing the rounds in the school. She’s better now. Daniel seems to have a new cold and his blood count has dropped a little so his oral chemo has had to be reduced. He remains in good spirits and is looking forward to seeing the Bristol Clifton suspension bridge and the SS Great Britain tomorrow with his class. I hope it’s not too cold. Update – Daniel loved the trip and is now an expert on Isambard Kingdom Brunel! Daniel goes from strength to strength. He saw his Consultant, who’s GREAT, and she recommended upping his chemo dose to 175%!!! That’s not even in his protocol. Anyway the higher the dose he can take the better. It helps to prevent any return of the NHL. Daniel’s had a few coughs and colds but nothing major. I’d like to say thanks to all the post pals out there. It’s been great reading the letters etc to the kids. On behalf of Daniel and his entire family, thank you for all your support over this year. It’s really made a difference to our lives. Merry Christmas and a Happy New Year to you all. Daniel continues to do well and his blood figures are great so he stays on 150% Mercaptopurine and Methotrexate… That’s over two months on 150 now! He’s loving being back at school. He did the Christmas Nativity play with his twin sisters. He was one of the choirboys messing about at the back with his friends! Daniel continues to do really well. He’s still on 150% of his 6MP and Methotrexate and his consultant is very pleased with how is able to tolerate this chemo. She said he must have very efficient kidneys and liver. She also said he doesn’t need to see the cardiologist for five years! Daniel loves being back at school. He’s even keen to practise his writing and spelling at home unaided!! He’s back to his old self again, at last. It’s been 12 months and 4 days since he was diagnosed and our lives changed forever… but wow, what a difference a year makes!! He’s a top boy that’s fought every step of the way. We are so proud of him. Daniel is doing really well. His bloods are very good and he’s been on 150% of chemo for the last two weeks. He had his first haircut in over 12 months yesterday. It’s starting to go a little darker. Daniel has started his football again helped by a recent visit to Bristol City and he’s even started Karate! I had my line out yesterday after 10 months! Daniel is doing well at the moment. He has just started his Maintenance Therapy which involves 2 years of oral chemotherapy. It shouldn’t knock him as badly as the previous eight months of intensive intravenous chemo. His blood levels recovered well enough for him to be able to return to school for the last week of term. He loved seeing his friends again. We’re hoping that his Hickman Line will be removed so that when he returns to school in September he’ll feel more himself. His hair has started to grow and he says he wants it to grow as long as Anakin Skywalker’s in the Star Wars film Revenge of the Sith!! He’s in good spirits and can’t wait to get back to school. He’s enjoyed all the post he has received as have his sisters. All the children loved making things with the modeling clay. Mostly fruit and Star Wars lightsabres!! He loved the cards had made by the Primary school. I, on behalf of Daniel, would like to say a big THANK YOU to all those kind hearted people out there. It really restores faith in human kind.